This project was conducted in the remote Aboriginal community of Wadeye in the Northern Territory, developed in partnership with the Kanamkek-Yile Ngala Museum and the Thamarrurr Regional Authority Aboriginal Corporation (TRAAC). The project focused on the audiovisual collection of the Museum, a vast collection of analogue and digital materials of high cultural significance to the Wadeye community. This project was developed in response to issues that were raised in a wider ARC Indigenous Discovery grant (IN130100007) - ‘Local Aboriginal community archives: The use of information technology and the National Broadband Network in disaster preparedness and recovery’. The researchers and partner investigators in this project examined the social and technological practices of the Wadeye Aboriginal community members in protecting intangible cultural heritage and their prioritisation of preservation requirements. 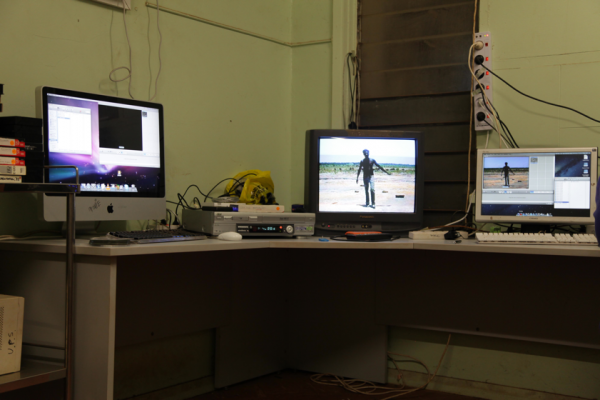 A key element of the project was the development of an audiovisual delivery platform that was trialled in the community, providing access to the archive for the people of Wadeye and inviting them to contribute their knowledge of the people, languages and events recorded. Ormond-Parker L., Langton M., Huebner S., Coleman J., Pearson C., Sloggett R., Nordlinger R., Smith K. & Clarke K., 2016, When Magnets Collide: Digital Preservation and Access of At-Risk Audiovisual Archives in a Remote Aboriginal Community, Melbourne Networked Society Institute, The University of Melbourne, Parkville, pp. 1-28.